Lay bacon slices on a rack over a sheet pan. 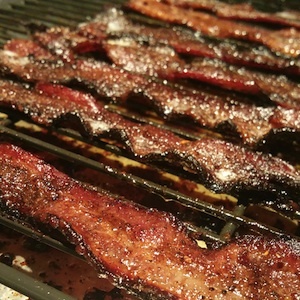 Season both sides of bacon with coffee rub, and brush both sides with a nice coating of Espresso Balsamic Vinegar. Place in oven for approximately 15 minutes…turning once…or until bacon caramelizes. This will happen fairly quick because of the balsamic, so keep an eye on it. Serve alone, as a side to a delicious breakfast, or on top of a burger. Delicious!